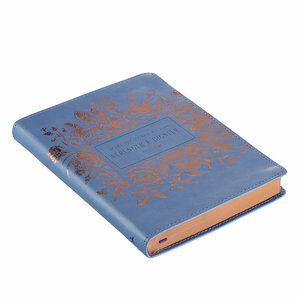 This gorgeous pale blue debossed luxleather journal will become one of your favorite accessories to carry with you. The Scripture verse from Proverbs 31:25 will remind you that the Lord has given you strength and dignity and you are a precious child of God. Set aside quiet time in your busy day to be near to God as you spend time journaling prayers and blessings in this beautiful journal. The Strength and Dignity classic luxleather journal is a handy size to tuck in a book bag, tote, or backpack. Each 240 lined pages contains a Scripture verse at the bottom. Attached is a matching satin ribbon pagemarker to mark where you left off. With a presentation page for a personal message, this journal makes a perfect gift for a friend or family member on their birthday, graduation, confirmation, or anniversary.